HUDSON, MA--(Marketwire - Sep 11, 2012) - Anver Corp. has introduced a vacuum tube lifter that provides an ergonomically sound alternative to manual lifting for loading and unloading bags and sacks from skids, pallets, and conveyors. The Anver VT-Series Bag Lifter lets an operator load and unload bags and sacks from skids, pallets, and conveyors without manual lifting and bending which can create health and productivity issues. 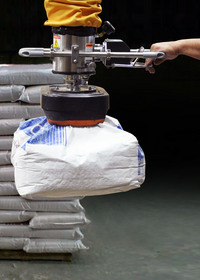 Developed for production use, this vacuum lifter for bags and sacks provides a 100% duty cycle, features instant attach and release, and speeds bag handling operations. Equipped with an ergonomic handlebar with fingertip controls, vacuum pad attachments with foam rubber sealing rings, and a choice of plastic or stainless steel housings, the Anver VT-Series Bag Lifter is constructed from all stainless steel for washdown environments. Suitable for standard 50-, 100-, and 125 lb. bags, air- and electric vacuum stations are offered. The Anver VT-Series Bag Lifter is priced from $4,995 (list), depending upon the vacuum pump size, construction, and vacuum pad attachment. Price quotations are available upon request. The Anver VT-Series Bag Lifter lets an operator load and unload bags and sacks from skids, pallets, and conveyors without manual lifting and bending. The Anver Vacuum Tube Lifter Handles Bags Weighing up to 125 lbs. It provides a 100% duty cycle and features instant attach and release to speed bag handling operations.